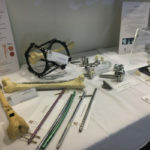 AOA Travelling Exhibition has arrived! 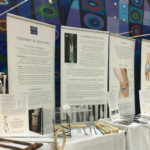 Murdoch Orthopaedic Clinic were delighted to have the Australian Orthopaedic Association’s travelling exhibition display onsite (located in the Medical Clinic’s main foyer) for two weeks in August. 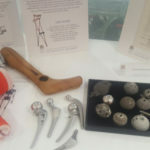 The Exhibition charts the development of orthopaedics in Australia and comprises prosthetic models, surgical tools, x-rays, fixation devices and pull up banners (on topics such as joint replacements, bones & fractures and even some interesting details on orthopaedics in war time). A major hit with the kids was Clarissa the skeleton. The travelling exhibition has now moved onto its next temporary home in Adelaide. We look forward to seeing it again in Perth next year, once it’s travelled the country and arrives back on our doorstep.